LAHORE: (Wednesday, August 8, 2018): Punjab University Vice Chancellor Prof Niaz Ahmad Akhtar has said that we need to promote unity among our ranks and culture of hard work for our respectful survival in the world. 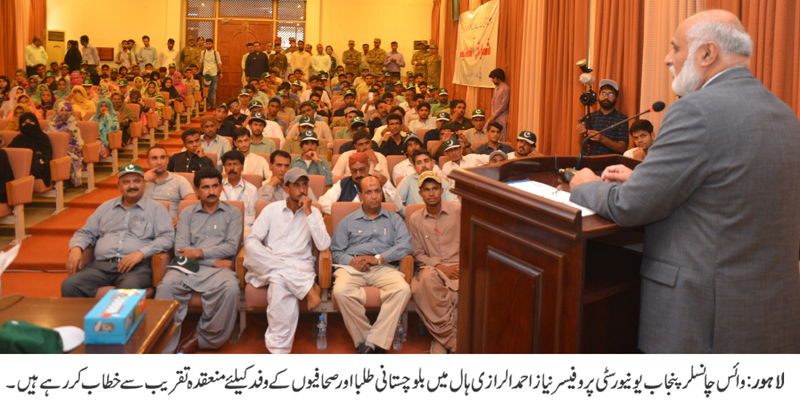 He was addressing a delegation of students and journalists from Balochistan at Al Razi Hall here on Wednesday. Director Students Affairs Iftikhar Chaudhry, Major Asif from Pakistan Army’s Southern Command, Voice of Balochistan’s Aamna Kahlon, journalists, teachers, male and female students from University of Turbat and various colleges of Balochistan were present on the occasion. Addressing the delegation, Prof Niaz Ahmad said that today’s Pakistan was the strongest than ever and the credit went to our armed forces and the people who made sacrifices. He said that we need to identify and resolve our problems without losing any hope as Pakistan’s future was bright. He said that PU was also ready to facilitate one semester for students from all provinces for promotion of national harmony. He said that we all were Pakistani and we must support each other. He said that we must understand the value and respect of our beloved country. He said that Pakistan was the second blessed country where young people were in majority. Prof Niaz Ahmad said that Pakistanis were full of talent and there were abundance of jobs for competent people. He said that if one was not educated, one was just like a blind in the present age. However, he said, being educated was not enough and we must have skill in our relevant fields as well. He advised the students to pursue higher education as there were a lot of vacancies in every field of life. He said that we must be thankful to our beloved Pakistan due to which we were living in an independent atmosphere having various opportunities. He said that the administration was extending full support to Balochistani students who were studying in Punjab University. He lauded Southern Command for its role in promotion of provincial harmony and ensuring peace in Balochistan. The Vice Chancellor also presented souvenirs to the distinguished guests and hosted luncheon in their honor. Earlier, the delegation paid visit to the PU Library.